Dave and Adam's Card World LLC (DACW) and Professional Sports Authenticators (PSA) today announced that they have formed a limited partnership to further the promotion of grading and authenticating gaming cards. The three year contract allows DACW to act as an official submission center for collectors and dealers looking to have their better gaming cards graded and authenticated. "This is a unique opportunity for us to work closely with one of the most innovative companies in the industry," said DACW C.E.O. Adam Martin. "PSA has revolutionized the sports industry and I am certain they will have a positive impact on the gaming card industry as well." "It's a simple matter of economics," said Len Osborne from Cardhaus Games in Seattle, Washington who is one of the largest sellers of quality Magic the Gathering cards in the world. "A Gem Mint card that lists in the price guide for $300 will often sell for $1,500 or more if PSA grades it as Gem Mint. At only $8.00 to have a card graded, how could you go wrong?" 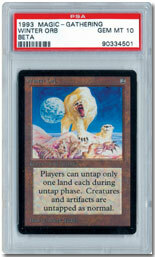 Already the impact of PSA graded Magic the Gathering cards can be seen on eBay on a daily basis as $20 cards that PSA graded Mint or Gem Mint typically sell for $60 to $150. Perhaps Joe Orlando President of PSA summed it up best by saying, "The inherent condition obstacle with gaming cards is that these cards, unlike traditional trading cards, are made to be handled frequently by those who play the games. With that in mind, super high-grade examples should pose a challenge and, if there's one thing collectors thoroughly enjoy, it's a challenge. If you couple that challenge with the passion that gaming card enthusiasts bring to the industry, this should be an exciting venture." For more information on gaming card grading, please contact Dave and Adam's Card World Press Officer, Steven Lucinski at phone number (716) 838-3300, extension 109 or by email at slucinski@dacardworld.com.